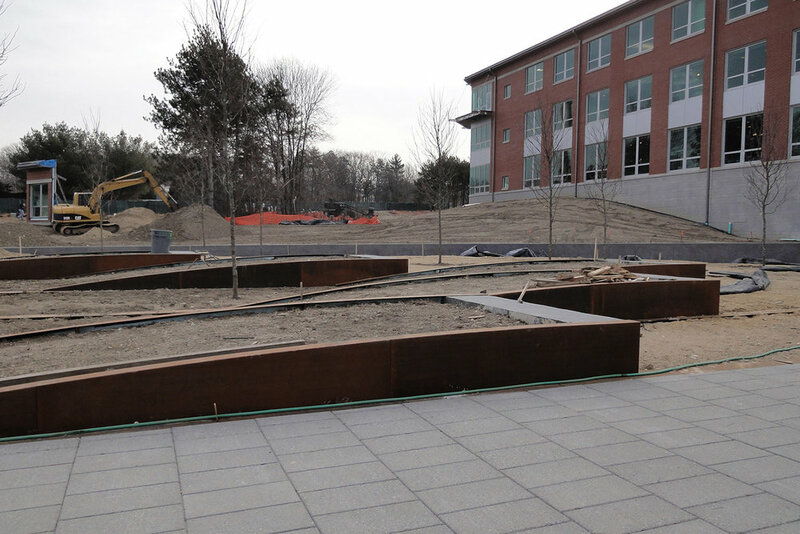 Located within Hanscom Air Force Base, the design for this 5 acre site includes preservation of significant wooded areas, maintenance of stream riparian buffer zones, and connections with the existing campus facilities. The site design concept focuses on bold forms adjacent to the new headquarters building that transition to a naturalized landscape beyond. The programmed outdoor spaces are organized around a central pedestrian spine through the building connecting the north and south courtyards. The main southern courtyard contains sculptural landforms defined by low curving core ten steel retaining walls. Flush steel bands extend from the building column lines into the gravel surfaced courtyard, connecting architecture and landscape. Stormwater infiltration swales in parking areas and drought tolerant plantings throughout the project are a few of the strategies employed for a sustainable site, and contribute to the anticipated LEED silver certification for the project.